The howler monkeys started at 5am, and the scarlet macaws were squawking by 5:30, and various other birds joined in the cacophony until it got light about 6. It was warm and humid (72), while it was near zero back home. This morning we had plenty of time to relax or go exploring around the lodge before our midmorning departure. Jeff and Susan hiked out to the old farm house to look for the bats that live in it. Along the way they saw a black ant shrike, a small group of coatis, a blue morpho floating around in a clearing, and some other butterflies and insects. The wooden building was still in reasonably good shape, with long nosed bats (Rhynchonycteris naso) clustered together in large groups on the wooden rafters under the tin roof, and an unknown species of sac winged bats roosting singly on the walls of the building. There were also some huge, mottled cinnamon-brown cockroaches on the walls. Although we were warned that it would be stinky, there wasn’t a lot of guano inside and really didn’t smell much at all. What a difference a few hours of driving makes. We left chilly Trogon Lodge up in the country’s highest mountain range to head south out of the central mountain range to the hot and steamy lowlands of the Osa Peninsula in the southwestern part of the country. As we went over the highest pass on the Cerro de la Muerte, we stopped briefly on the roadside in Tapanti National Park to see some of the plants characteristic of the páramo. The páramo is the ecosystem of the regions above the treeline and below the permanent snowline in the northern Andes of South America and adjacent southern Central America. This high, tropical montane vegetation is composed mainly of rosette plants, shrubs and grasses. The weather is generally cold and humid, but it can fluctuate suddenly and dramatically. The páramo in Costa Rica is a dwarf forest, dominated by the dwarf bamboo Chusquea subtessellata, together with short trees in the genus Escallonia, and low shrubs and herbs, many of which are endemic to the mountain top. Just about the only downside to being in such a remote location was the lack of TV (and until a few months ago, internet access; we found out Sunday morning that they DO have internet now; their website needs to be updated). Fortunately the fact that it was Super Bowl Sunday didn’t even come up until lunch time and no one was particularly concerned that we would miss the big game (but with a large contingent of Wisconsin residents on the this trip, I can’t imagine what we’d have done if the Green Bay Packers had been playing…maybe have to take a boat and then a taxi to get to a bar in Golfito to watch the game?). Without much connection to the outside world, this time was an opportunity to focus on something other than screens, and appreciate the incredible natural world around us. 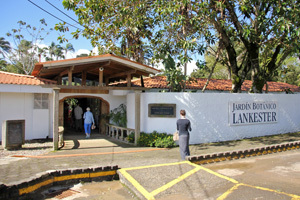 Entrance to Lankester Botanical Gardens. We started off the tour this morning with a visit to the University of Costa Rica‘s Lankester Botanical Garden in Cartago, which specializes in orchids and other epiphytic plants. Costa Rica is home to about 1400 orchid species, 20% of which are endemic. The Garden cultivates more than 8,000 orchid specimens, of which more than half are native to the country. Most of the group chose to travel to Costa Rica a day ahead of time (for those whose flights would arrive late in the evening) so we had a day to relax and enjoy the extensive gardens behind the hotel or explore the city. Kari, Dwight, and Mary Kay arrived in midafternoon, while Susan, Cindy, Judy, John and Lila got in about 10pm, while Ian and Val were last to show up that night about 11:30pm. It wasn’t that cold when we left Wisconsin, but it was still nice to emerge from the terminal into mild conditions. There had been a few showers in the city that day, but we were lucky and it was mostly sunny on our free day before the welcome dinner.